Listen to this Destination: BBQ article. The Bessinger family of Holly Hill is arguably the most important family in the history of SC BBQ, and that is a long and storied history. Originating in Orangeburg County in the late 1930s, when patriarch Joe Bessinger opened his Holly Hill Café, the Bessingers became the first family of SCBBQ. From Joe, his boys learned to cook whole hogs over wood embers and learned to make what may well have been the world’s first mustard-based BBQ sauce. Over time, the boys split out to establish a number of SCBBQ’s favorite restaurants, including Melvin’s, (Mt Pleasant and James Island locations), Maurice’s, 13 Piggie Park locations at the time of this writing, Bessinger’s, Robert’s, Joe Bessinger’s, and others. While the BBQ and the sauce are SCBBQ classics (and the onion rings deserve a mention here as well), I can’t remember the last time I ate BBQ and didn’t have a serving of collards on the side if they were available. 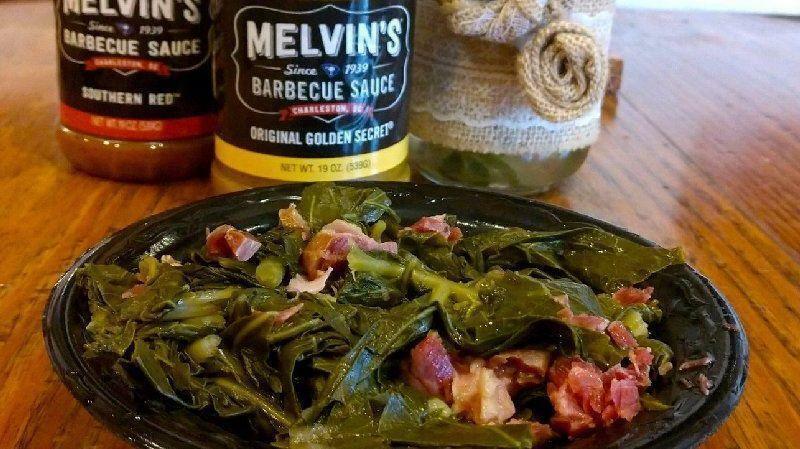 Some are salty, some are sweet, but when done right, they all are delicious…..and Melvin’s does them right! Get all the recipes we’ve published on this site and more collected together in over 150 pages of recipes, stories, and history in our cookbook, SCBBQ Recipes: Going Whole Hog. 1. Using a large saucepan over medium-high heat, combine water, ham hocks, onion, chicken base, brown sugar, and pepper and boil for 30 minutes. 2. “Peel collards” by separating the leaf from the thick center stalk, discard stalks. Coarsely chop leafy collards. 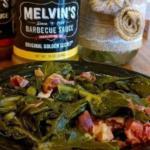 Add collards to seasoned water. Boil until collards are tender, about 60-90 minutes, adding water as needed to keep collards submerged. Thanks, Jen! Hope you were able to try them and had a great visit with your family. What a great gift – right in time for the holidays when I will be spending a lot of time with my collards loving family. I should have this down by now, but excited to have this well-loved version to try. Thanks for sharing!